Join the fun at Miller's Crossing! We have a great selection of local microbrews and many others from around the country. We feature many tempting "Montana Made"" cocktails from distilleries around the state. Weekly events include Margarita Monday, Trivia Tuesday, Montana Made Thursday, and a DJ Dance Party on Saturday. We have live music every Thursday evening and at least one Friday a Month! Kitchen is open for lunch and dinner until 9:30 p.m. every day. 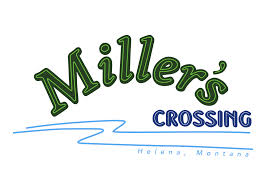 Miller's Crossing- a place for social interaction."